Franklin, NH – Through a series of personal and professional connections and a mutual passion for social responsibility and sustainable design, Developer Todd Workman of Franklin and Architect Kyle Barker of Concord came together in 2015 with a common goal of creating a project that would bring new life and resources to the area. With a vast knowledge of community design, historic preservation, permaculture and a solid history of developing renovation and adaptive reuse projects, Warrenstreet Architects then turned to CATCH Neighborhood Housing, a long-time client and partner in past collaborations for their expertise and proven track record of developing and maintaining affordable quality housing. The combined efforts of many instrumental partners in this projects success were celebrated at a ribbon-cutting ceremony held on Friday, November 24th. A 45-unit facility comprised of one and two bedroom apartments featuring large windows, tall ceilings and the charm of an old mill. Amenities include large common areas, a common courtyard and a community garden. 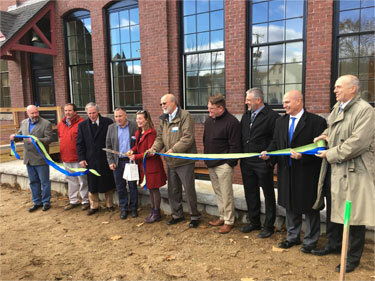 Located along the banks of the Winnipesaukee River and next to Odell Park, the project has received overwhelming support and is seen as the first step in the revitalization of downtown, serving as a catalyst for the increase in livability and vitality of the City. Warrenstreet provided full architectural services from conceptual design through construction administration.